Have I mentioned that I’m just a *teeny* bit excited for New York Fashion week next month?! lol. One of the things I love so much about attending fashion week is the opportunity to really play with fashion and put together outfits a bit more bold than my daily work looks. This is one such outfit. I wanted to create a modern street-style meets 1930’s glam look, and this outfit was the result. I love the chance to plan these outfits because when I wear them for a weekend event in my ‘normal’ life I feel so confident and bold. Something about a bold outfit that you feel creatively attached to is just all about the confidence boost! The reason I was inspired to create a modern street style meets 1930’s glam look is this fur stole. Let me start by saying I don’t personally support fur or animal products in making clothing but I do feel comfortable wearing vintage pieces that are. This fur stole belonged to my grandmother, and I inherited it when she passed. I wear it with pride, despite the fact that I wouldn’t choose to wear fur, because it was hers. I love knowing that she worth this out for fancy events over and over during her life. The stole itself is from the early 1930’s which is just mind blowing to me. So cool. 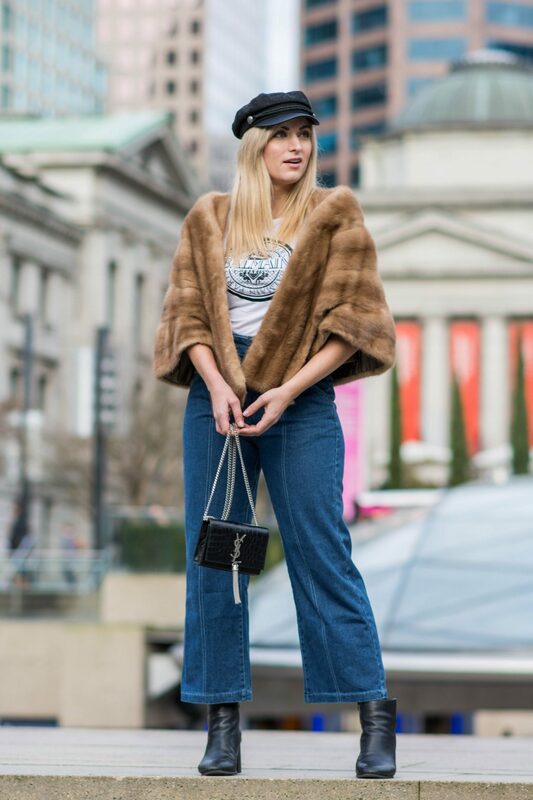 To make the fur stole more modern and street-style appropriate I decided to pair it with a graphic tee and my denim culottes. These culottes are one of the “wins” from cheap online retailer SheIn. Their clothes can be so hit or miss, but these denim culottes are fantastic, especially for the $30 price tag. I highly recommend them if you’re looking for a pair of on-trend, affordable denim! 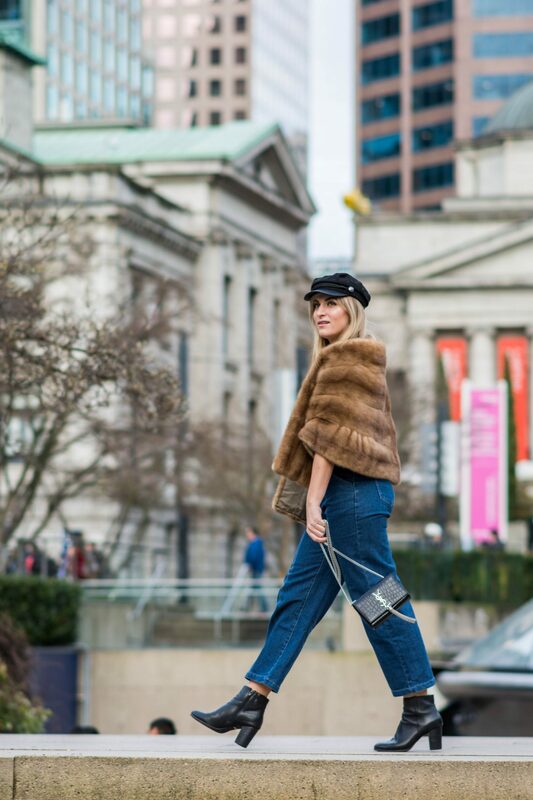 As far as the rest of this outfit, I’m rocking my go to cabby hat (a Forever 21 find that I adore), my Vionic Shoes ‘comfort fit’ ankle boots that I swear by, and my insanely cool YSL embossed croc kate bag. This bag felt like the perfect accessory for this look since the embossed croc and metal tassel give me those exact 1930’s meets modern street style vibes. In case the outfit and the title of this post didn’t give it away, I am in full on “getting ready for New York Fashion Week” mode. While NYFW is an amazing experience, there is a lot that goes into it in the week’s leading up to it that I’m not sure people really know about. So to give you a sense of what getting ready for New York Fashion Week entails, I thought I’d share my to do list. "Things to Do When it Rains in Vancouver This Winter"
"6 Instagram Accounts to Follow in 2019"
My grandmother had the same! In black! Those vintage pieces are precious aren t they! Hope to see you on my Fancy Friday linkup party! Ah that’s so cool!! I hope you still have it! And yes, they are so so precious. So cute, Lee! Have fun at NYFW! You look amazing! Have the best time at NYFW! Im hoping to do London in September, hopefully we’ll both get to go and hang out!! That outfit is just beyond cute and you look so ready for New York Fashion week. So jealous. Thanks so much girl, it was such a fun one to put together! And ahh I wish you were going, would love to finally meet in person! How exciting babe! Loving your outfit and have an amazing time at NYFW! Have such a wonderful time at NYFW! I hope it warms up a bit for you! Thank you so much! and ughhh, me too! I am such a wimp about the cold! So cute! Love how you styled these pieces together! Have the best time at NYFW! I love all these tips! So excited to see your beautiful face in just over two weeks – eek!!! Thanks girl! And yass so excited to see you!! This is such a fun look! 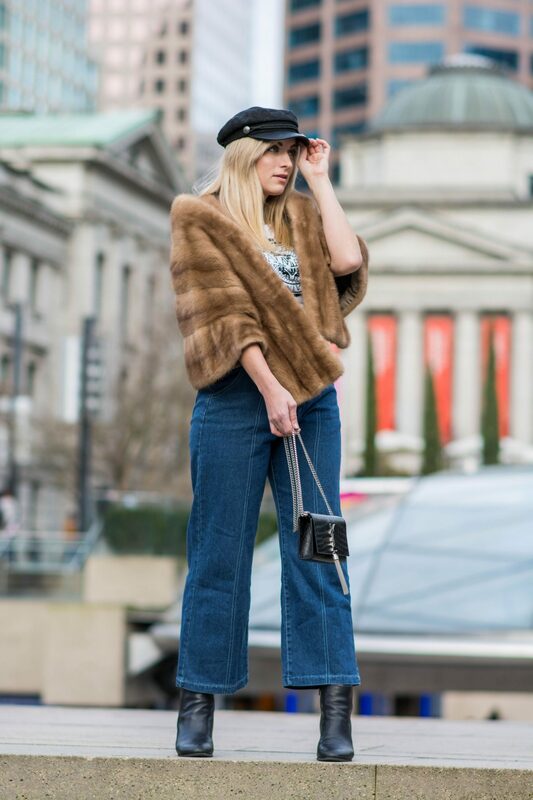 I love the fur and the those flares are fabulous! Your hat is everything!! Love it paired with your top! Over here trying to plan and get ready as well! Last year I just bought a bunch of stuff and threw it in my suitcase! 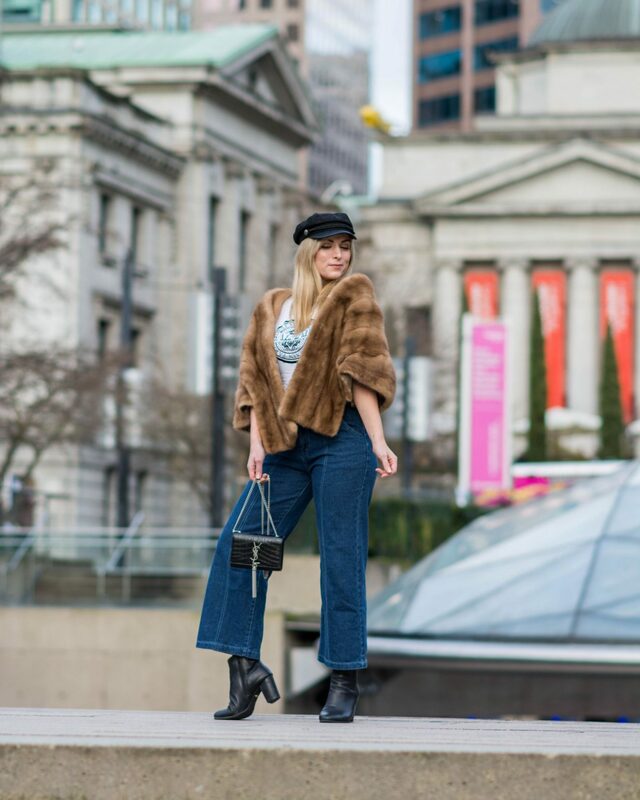 Loving this outfit with the fun cropped fur! The planning takes so much time eh! It always amazes me that I end up needing HOURS to organize and plan all my outfits. But it’s so so worth it when you’re there and dont have to think about what to wear with what; you know exactly what to throw on so you can get out the door. Anything that saves time during the chaos of fashion week is huge in my books haha.